POLYNESIA, MEANING “many islands” (Greek), is one of the three main divisions (the others being MICRONESIA and MELANESIA) of Oceania. This division is based upon the ethnological background of the different islands’ inhabitants. Geographically, Polynesia is a triangle area of islands, with the Hawaiian Islands at one corner, NEW ZEALAND at another, and EASTER ISLAND forming the third corner, located in the central and South PACIFIC OCEAN. The larger islands are generally volcanic in origin; the smaller ones are generally coral formations. The principal groups are the Hawaiian Islands, SAMOA, TONGA, New Zealand, KIRIBATI islands, COOK ISLANDS, and the islands of FRENCH POLYNESIA. Malayo-Polynesian languages are spoken in Polynesia. One of the biggest questions concerning Polynesians is where did they originally come from and how did they get to the distant islands that comprise what today is known as the Polynesian Triangle? 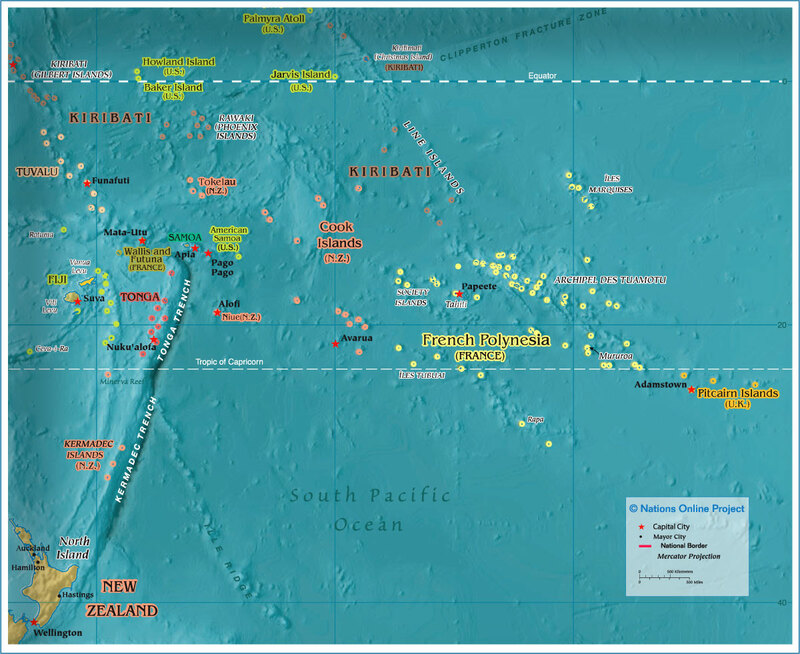 Numerous disciplines have become involved in trying to trace Polynesian origins; among them are geographers, anthropologists, archaeologists, and historians. One way of trying to determine the settlement issue is to study the various languages and oral traditions of discovery by the numerous Pacific peoples. Other avenues of answering the settlement question include archaeological excavations, including those focusing on a distinctively decorated type of pottery called Lapita, and tracing the origins of the various food staples found in Polynesia. The earliest descendants of the Polynesians were believed to have started their Eastern trek into the Pacific around 1500 B.C.E. Starting from New Guinea and moving east through the SOLOMON ISLANDS then the VANUATU islands. As the early Polynesians moved farther to the east, the distances between the islands increased from tens of miles, to hundreds of miles, to in some cases over a thousand miles. Superior sailing skills is one of the attributes of the Polynesians that allowed them to traverse such great distances and unfavorable conditions to settle the various islands groups that make up Polynesia. The Polynesia sailing craft was an early catamaran consisting of a double canoe made of two hulls connected by lashed crossbeams. This served two purposes: the first was that the design provided stability and the second was that it increased the capacity to carry large loads. The hulls were large enough to carry all their supplies and equipment. The central platform created over the crossbeams provided working, living, and additional storage space for the seafarers. Sails made of woven matting powered the ships, which were by long paddles enabling them to keep on course. The canoes were generally 49 to 65 ft (15 to 20 m) in length and could carry 20 people with all of their supplies needed to colonize newly discovered islands. Among the supplies carried on these crafts were domesticated animals (pig, dog, and chicken) and planting materials to begin new cultivations at their homes: sweet potato, taro, bananas, yams, breadfruit, and sugarcane. They developed a portable agricultural system to compensate for the decreased flora and fauna they found on the new islands. The Polynesian navigation system was based on star observations, ocean swells and currents, and the flight patterns of birds along with other natural signs to find their way across the great ocean open distances they traversed. Polynesia today is a mix of political and economic systems reflecting the large area that it covers. Most of the island groups have their own sovereignty, while others are either under the administration of or have special relations with foreign countries: French Polynesia with France, and Cook Islands, NIUE, and Tokelau with New Zealand. The Hawaiian Islands became the 50th state admitted to the UNITED STATES in 1959. The economies of the various islands are also varied. Tourism plays a very large part in the economies of all the island groups in Polynesia. But because of their small geographic size, natural resource exploitation is generally limited to specialized agriculture and fisheries. A large number of Polynesians make their home in Auckland, New Zealand, which is the largest Polynesian city in the world.